Amnesty International is gravely concerned at reports that Iranian journalist Akbar Ganji was tortured and ill-treated by Iranian security officers in Milad hospital in Tehran. The organization calls on the Iranian authorities to launch an immediate investigation into these allegations, to grant Akbar Ganji immediate access to medical examination and any necessary care by an independent doctor of his choice. Amnesty International reiterates its call for Akbar Ganji’s immediate and unconditional release as he is a prisoner of conscience detained solely for the peaceful expression of his beliefs. In an open letter published today on the Emrouz news web site, Akbar Ganji’s wife, Massoumeh Shafii, reported that she was allowed to visit her husband on 18 October 2005, that is 51 days after she had last visited him in hospital on 28 August. She states that her husband told her that two days after her last visit, a team of Iranian security officers visited him in hospital and asked him to apologize in writing for his book “Republican Manisfesto” and for the letters he had written to Ayatollah Montazeri, and to undertake not to give interviews if was to be granted prison leave. Akbar Ganji refused and was reportedly severely beaten by the same officers while in the quarantine wing of the Milad hospital. On 3 September Akbar Ganji was reportedly told by the head of the of same security team that he was about to be released and that the officers who had beaten him would apologize for their actions. He was then driven to Evin prison and during the car journey he was reportedly ill-treated and suffered a dislocated shoulder as a result. His request to be taken back to hospital was denied and he was given physiotherapy by a prison doctor. He remains in Evin prison, serving the rest of his six-year sentence. Akbar Ganji had recently ended a two-month hunger strike, during which his health deteriorated, and Amnesty International is concerned that his condition will worsen unless he receives prompt and adequate medical care. The detention and treatment of Akbar Ganji, imprisoned since April 2000, has raised widespread concern at the level of the international community. On 19 August, the United Nations (UN) Secretary General Kofi Annan called on President Ahmadinezhad to release Akbar Ganji. On 12 October the European Union (EU) also expressed concern at increased restrictions on freedom of expression in Iran. Akbar Ganji began a hunger strike on 11 June in protest at being denied the necessary medical care for chronic asthma, despite specialist recommendation that he be treated outside prison. He was eventually rushed to Milad hospital on 17 July, as his condition deteriorated. He ended his hunger strike in mid-August, after nearly 70 days. He had reportedly lost over 30kg, and had been moved to an intensive care unit a week before he resumed eating. 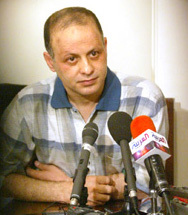 Akbar Ganji, now aged 46, was arrested in April 2000, together with 17 other Iranian journalists and intellectuals who had taken part in a cultural conference in Berlin. He was sentenced to 10 years' imprisonment, which was reduced on appeal to six months, for "taking part in an offence against national security" and "propaganda against the Islamic system" (For details see EXTRA 43/00, MDE 13/07/00, 25 April 2000, and follow-ups). In July 2001 he was again brought to trial on charges of "collecting confidential state documents to jeopardize state security" and "spreading propaganda", and was sentenced to six years’ imprisonment. In 2000 he had written a series of articles, which were later published as a book, in which he implicated several high-ranking officials in the 1998 murders of several prominent writers and political activists, in what became known as the "serial murders" case. Among those implicated in the articles was the former President, Akbar Hashemi Rafsanjani.